Looking for a simplistic yet stunning necklace? This one of kind Rose Gold necklace is perfect for you. Looking for something to add a little bling to your office wear that isn't overpowering? This sleek beautiful necklace features hints of sparkle without being blinding. Looking for a beautiful necklace to wear to that wedding but on a tight budget? This necklace would look great on you and is economically priced. The leaf of this magnificent pearl rose gold necklace has been handcrafted from red-toned jeweler's brass. The leaf was hand cut, edges filed to smooth, and then forged and shaped to give an organic look. Subtle glimmers of gold shine from underneath the red tone coloring of this pendant giving it a Rose Gold look. The leaf shaped pendant has been quadruple sealed with an industrial strength acrylic coating to protect against tarnish. The center bead of this crystal rose gold necklace is a lovely clear acrylic peach colored bead sandwiched between two gold crystal rhinestone spacers and peach colored crystal pearls. The bead combination has been strung on pure copper wire and attached to the necklace. The lovely long Rose Gold necklace features a mix of peach colored crystal pearls and sparkly peach crystals. The necklace has been accented with four larger pearls and two crystal spacers. The beaded area of the necklace has been attached to a Rose Gold plated copper link chain. 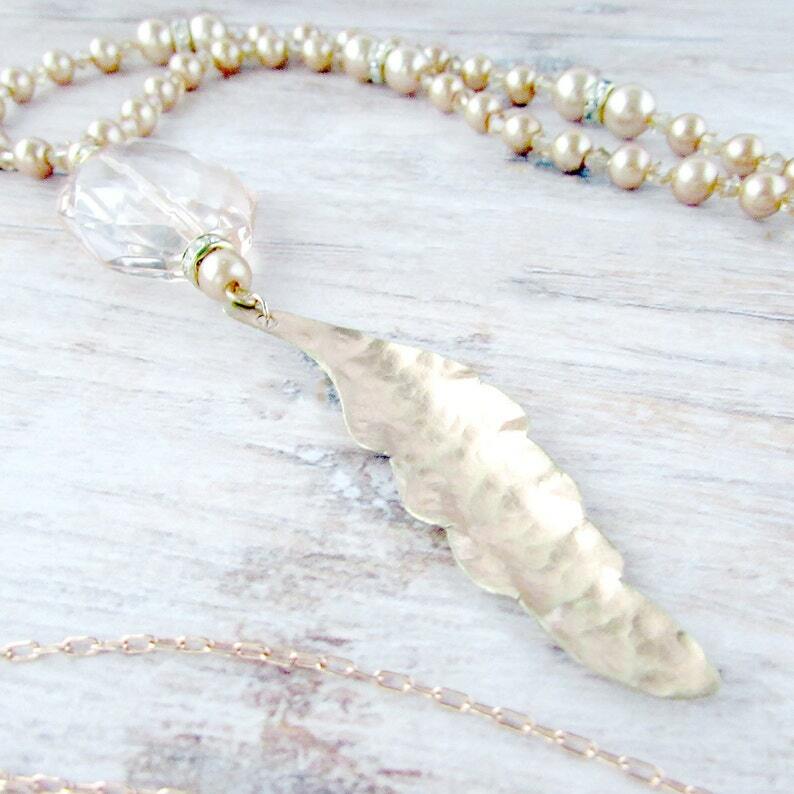 This necklace is long and doesn't need a clasp. This necklace measures approximately 34 inches (86.36 cm) in length. The pendant measures approximately 4 inches (10.16 cm) in length.